Worm Gear Reducers are available in C-Face mount in four different assemblies; right hand, left hand, double shaft, and hollow bore output. Bases are sold separately. Gear speed reducers come with double lipped oil seals and double bearings used on both ends of shaft. 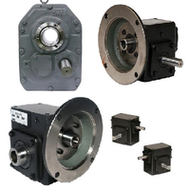 All worm gear reducers are universally interchangeable. We carry shaft mount reducers with Ultra-high quality NSK bearings with Case hardened shafts and gears. The motor housing is made from all cast iron housing with extended gear centers and tooth contact. The Metal reinforced double lip with spring loaded oil seals for anti-leakage. The reducers are designed dimension for drop-in on all major makes. Flower pot flange kits or mounting bases are available as an optional purchase for mounting purposes. Rainbow Precision would be glad to assist you. Contact us for more information regarding worm gear reducers or their accessories. You can also request a quote.